Tell us a little bit about your internship experience. "I spent eight weeks at an REU (Research Experience for Undergraduates) at the University of West Georgia researching Graph Theory and Ramsey Theory on the Integers under two faculty mentors. I worked with seven other math majors from around the country, and gained experience in the process of researching pure mathematics. We also had opportunities to present our work in verbal and written form." "I had a friend and mentor who was a senior math major when I was a freshman. She participated in an REU during her time at Saint Joe's, and gave me a sense that it was a very valuable experience. Last summer, when I was considering options and trying to decide if I wanted to pursue research / graduate studies I remembered her advice, and searched the National Science Foundation's list of program sites for mathematics. (Google "NSF REU sites.") I carefully considered the topics and problems for each site, narrowed down the list and applied to five." What is some advice that you would give to students who are currently searching for internships/who are about to do their first internship? 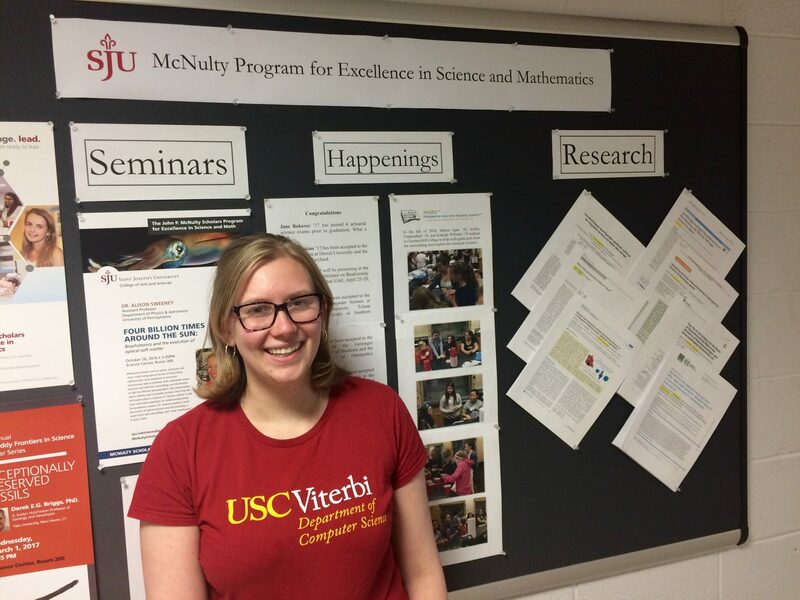 "I would encourage people in the natural sciences, math, or computer science to consider the NSF REU programs. There are tons of sites to choose from all over the country, and most programs are 8-10 weeks so it's a great opportunity to spend part of your summer somewhere fun while gaining valuable research experience. The programs typically include a stipend, a food allowance, travel reimbursement, and housing. The benefits of an REU can also reach beyond the summer. It was also a chance to meet other math majors from all over the country, who have become some of my very good friends. We've also since presented our work together at two conferences, which is a great experience, especially if you are considering graduate school!" Did you take part in any additional experiential learning opportunities while at SJU? "I was a member of Phi Beta Kappa and Upsilon Pi Epsilon computer science honors society. I was also the president of Pi Mu Epsilon math honors society, a tutor in the Writing Center, and a supplemental instruction peer leader here at SJU." What inspired you to continue your education?